I'd come down into south Essex on what they quaintly call round here 'Ride and Stride Day', to explore churches normally kept locked without a keyholder. It had been raining since midnight, and when I got off the train in Chelmsford at about 8am there was a gloomy, penetrating drizzle, giving something of the effect of cycling underwater. 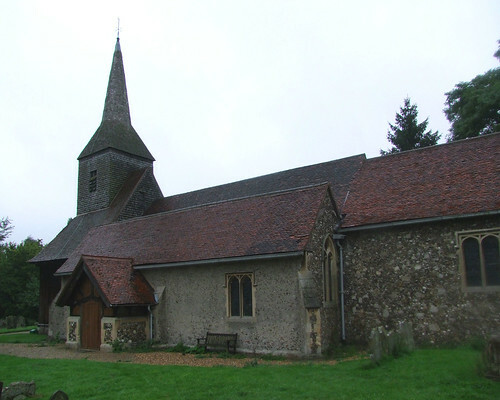 I headed south down the lanes to the outskirts of Ingatestone, where I found Margaretting parish church locked, but with a keyholder notice.I had arrived an hour before the open churches event was due to start, so I suppose that it was no surprise to discover that the church was not open. Mind you, they didn't seem particularly geared up for it. Uniquely in England, you reach Margaretting churchyard across a level crossing, and as this is on the busy Liverpool Street to Essex/Ipswich/Norwich line, there are trains every few minutes. The keyholder is on the opposite side of the tracks to the church, which led to a certain amount of fiddling about as I waited in each direction several times for the barriers to open. The tower, like Blackmore, is an aisled wooden structure, splendid even in the drizzle, but theinterior is almost entirely late 19th Century in character. However, the star of the show, and a surprising one, is a 14th Century stained glass tree of Jesse, reset in the east window. It put me in mind of Ste-Chapelle in Paris. Most unusual in such a cosy setting.